The first few months of the war were characterised by inaction and nicknamed the ‘Phoney War’. People were affected by wartime measures such as the blackout and restrictions on travel and food, yet there were no enemy bombers in the sky. Any complacency was destroyed, however, by the evacuation of the British Army from Dunkirk in May, 1940, and the fall of France a month later. As a county, Sussex was heavily involved in the evacuation, fishermen and boat owners responding immediately to an appeal from the government. Over 850 vessels, fishing boats and pleasure boats alike, took part in the mission and rescued over 200,000 British troops. The evacuation of Dunkirk, May, 1940. But evacuation does not win wars and when France fell on 17 June, the British people stood alone, braced for invasion. The landing of German troops by parachute into Holland and Belgium was a dire warning of what might happen, and leaflets were issued by central and local government urging people to stand firm ‘if the invasion comes’. The flat coastline of the county was ideal for landing troops and tanks from invasion barges, and under Hitler’s Operation Sea Lion planned for September, 1940, Sussex would have been part of the bridgehead of the German 9th Army – but for the Battle of Britain. 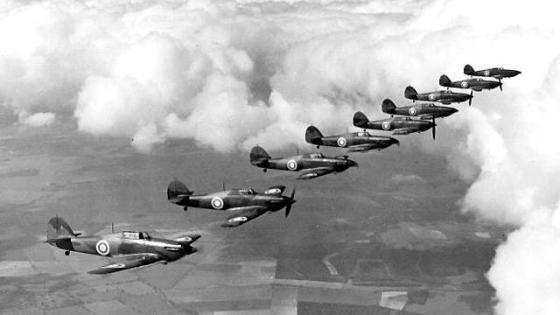 Through the hot summer days of 1940 and into early autumn, conflict raged in the skies over Sussex, its inhabitants eye-witnesses to the dog-fights as the ‘Few’ beat back the Luftwaffe in their attempt to clear the way for invasion. Today it’s difficult to imagine how close to the fighting people came. Spitfires and German ‘spotter planes’ flew low and it was easy enough to identify either the red, white and blue circles of the RAF or the menacing black swastikas of a German plane. One resident recalls that, as a child, he saw a German pilot hedgehopping his way across the county and smiling and waving to the children playing in the fields below. While the Battle of Britain raged, the number of air raids intensified and wave after wave of German bombers flew low over the Downs towards London. Hit-and-run raids became a feature of Sussex life, with bombs dropped by enemy aircraft aborting their missions inland. Coastal towns such as Brighton and Littlehampton suffered particularly badly. All along the Sussex coast, anti-invasion measures were put in place and the whole coastline from Hastings to Dorset, plus an area twenty miles inland, was declared a defence zone and barred to visitors. 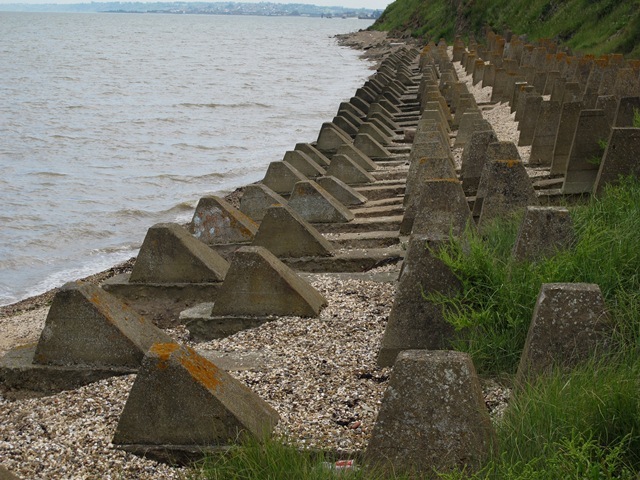 Barriers of six feet high concrete anti-tank blocks, ‘dragons’ teeth’ as they were called, were built along the exits of every beach, and square or hexagonal machine-gun pill-boxes erected on seafronts, at road junctions, and at other strategic points to form ‘stop lines’ to prevent an inland advance by the enemy. In the dark days of 1940-41, Sussex was not only a stronghold of defence but a springboard for attack, when and if the balance of war shifted in the Allies’ favour. Troops and equipment poured into the county and convoys of soldiers trundled through its country lanes. Jeeps were parked in people’s driveways, lorries along the grass verges and private houses were asked to provide additional accommodation. In The Secret of Summerhayes, the fictional but grand Arts and Crafts mansion is requisitioned early in the war and by 1944 bears a huge number of scars from military occupation. There were large numbers of British and American soldiers in Sussex, but an even greater number of Canadians. Some 330,000 Canadians passed through training at Aldershot and from the autumn of 1941 to early 1944, the defence of the United Kingdom, and particularly the Sussex coast, was largely in the hands of the 1st Canadian Army. The Canadian Army manned coastal defences between Newhaven and Worthing, while the whole of Sussex was used as a training ground. Sussex, in effect, had become one vast military camp and, along with other southern counties, was cut off from the rest of England. Together with British troops, the Canadians engaged in a series of major exercises, and the screech and clatter of tanks and the pounding of heavy artillery regularly shattered the tranquillity of the countryside. Canadian soldiers in The Secret of Summerhayes spend long days tramping the Downs, fording rivers and ‘landing’ on beaches. Much of the South Downs was requisitioned as an intensive training area – properties were vacated, farming operations curtailed, and training gallops taken over – and holiday beaches became practice grounds for invasion. Check points were everywhere, with barriers blocking the roads and a pass often needed to reach the home beyond. Residents endured this inconvenience, and the deprivations and dangers of wartime, with admirable stoicism. At the same time, they also made a very large contribution to the war effort. A huge increase in industrial production had been necessary, particularly of armaments, and many factories and workshops were turned over to munitions work. Women were recruited to staff the factories, and also to play their part in the fields through the Women’s Land Army. 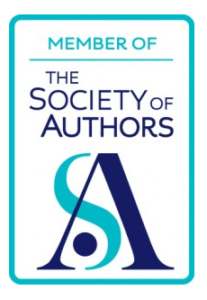 Their green sweaters and corduroy breeches became a familiar sight in the countryside. They cleared ditches and laid hedges, spread dung and milked cows, drove tractors and worked horse teams. Our life was haunted by leaking wellies, damp socks, hunger and fatigue, wrote one land girl who, for 45 shillings a week, worked a one thousand acre farm near Chichester. Even with the land girls’ best efforts, food supply remained a problem. Ration books were issued in September, 1939 and food rationing began in January, 1940, with bacon, sugar and butter. (Rationing in the Second World War) People had to register with named shops for each category of goods. Clothing rationing followed in May, 1941, along with meat, tea, jam, biscuits, cereals, cheese, eggs, lard, milk and canned and dried fruit. Despite rationing, shortages ensued and queuing became a way of life. In the kitchen, improvisation was essential: egg powder instead of eggs, margarine instead of butter, mashed parsnips to make custard. Bethany, the heroine of The Secret of Summerhayes is overjoyed to be given three ‘real’ eggs as an unexpected gift. For one week at least, the egg powder can stay in the cupboard! 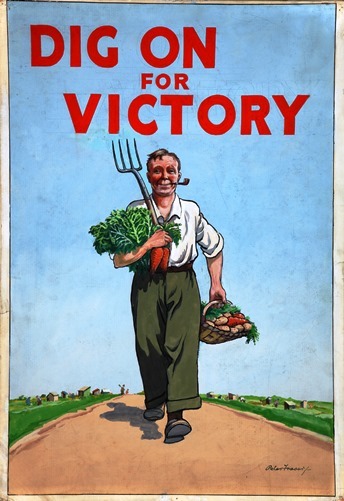 Gardens were dug up and allotments rented as people were encouraged to ‘Dig for Victory’and grow their own fruit and vegetables. The war effort required other responses: salvaging paper, sacrificing iron railings and wrought-iron gates to build ships, metal toys and aluminium pots to make war planes. Periodic fund-raising supported the ever increasing war budget through a government campaign to invest in National Savings, and through special appeals in towns and villages that raised astonishing sums of money. The people of the City and Rural District of Chichester were set a target of £250,000 for War Weapons Week in May, 1941. Concerts, dances, whist drives and competitions were held, and a total of £621,000 was raised – a staggering amount by the standards of the day. In the months leading up to D-Day, the concentration of troops in the area became even more intense and enormous quantities of ammunition were stockpiled. There was uncertainty right up to the evening of 5 June, 1944, if the weather would allow a seaborne invasion. In fact, the invasion was delayed for a day, but on the morning of 6 June the signal was given and every trace of the military disappeared: men, tanks, trucks and guns. The previous night many people in Sussex, directly under the flight path of the 6th Airborne Division, had lain awake listening to the drone of the paratroop transporters en route to the landing beaches. 9 June, 1944: Into action with the gliders. Paratroopers drop into Normandy. 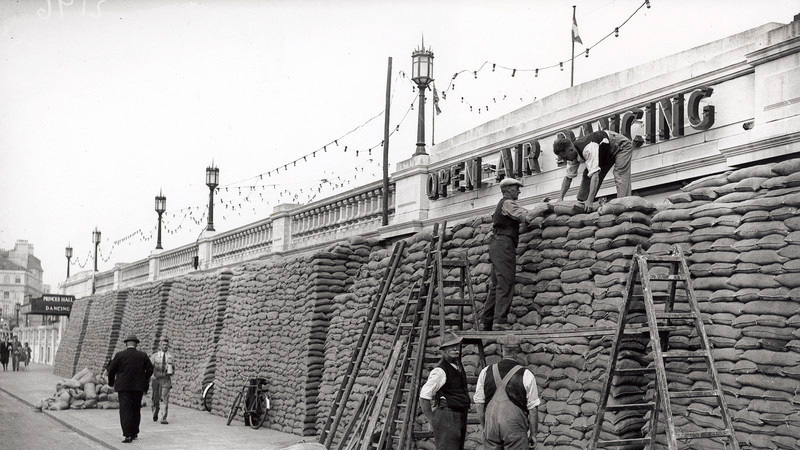 As the Allies fought their way through occupied Europe towards Berlin, the coastal defences were gradually removed – the dragons’ teeth and pill boxes demolished and the barbed wire unfurled from the promenades to give small children their first glimpse of a clear seafront. The beaches, though, still had to be cleared of mines. The formal German surrender was taken by General Montgomery at Luneberg Heath on 4 May, 1945. Tuesday, 8 May was declared a public holiday, VE (Victory in Europe) Day. The celebrations took many forms: bonfires blazed along the top of the Downs, effigies of Hitler were burnt, people danced and sang – Sussex by the Sea featured heavily. One of the most popular ways of celebrating was to forget rationing for a day and hold a street party. One little boy, given lemonade, cake and ice cream (unheard of luxuries at the time), was heard to ask Is peace like this everyday?